Riding our bikes through the heart of Provence, we visit ancient vineyards, hilltop villages and discover the landscapes that inspired Vincent Van Gogh to paint here. We cycle past the ancient 'bories' (stone houses) in the Luberon and the Roman remains in Orange, perhaps stopping to visit the region's elegant Romanesque abbeys or to enjoy mouth-watering Provençal cuisine and local wines. We join our trip at Marseille Airport then drive to the pleasant Provençal town of Orange. Steeped in history dating from the early 1st century AD, there are many treasures to see, including the recently restored Arc de Triomphe to the still used Roman theatre. Having had a chance to familiarise ourselves with our bikes, we start by exploring the area around Orange. There is the opportunity to cycle south of the town through world famous vineyards to the small village of Chateuneuf du Pape. There will be ample time to sample some of the regions' famous wines and explore the ruins of the chateau which was built as a summer residence for the Popes of Avignon. After lunch we can return to Orange following the course of the mighty Rhone taking a break in the village of Caderouse, where ramparts encircle the village. Today provides for a gentle introductory ride, but alternatively you can just follow the local back roads through small, quiet villages to give a longer optional cycle route. Later this afternoon you may like to visit the large and well preserved Roman theatre and triumphal arch. Our total cycling distance today is approximately 35 kilometres (Total 112 metres ascent and 113 meters descent), plus optional extra 31 kilometres. We leave Orange, cycling east through the interesting village of Cameret-sur-Aigues and vineyards to Séguret at the foot of the Dentelles de Montmirail. Séguret is an open balcony on the Rhône Valley, sat beneath the medieval castle remains surrounded by vineyards which produce a very respectable Côte du Rhône. Inhabited since prehistoric times and enriched in Gallo-Romano times, today's village was built in the 10th century and belonged to the Papacy before becoming part of France revolution in 1793. Continuing on our way towards Carpentras we pass through the villages of Gigondas and then Vacqueras, birthplace of the troubadour poet Raimbaud. Along this section of the ride there are some excellent views of the limestone pinnacles and the opportunity to try some of the best Grenache wines produced in the foothills of the Dentelles. Our total cycling distance today is approximately 47 kilometres (Total 269 metres ascent and 215 meters descent), plus optional extra 23 kilometres. With three nights in Carpentras you may wish to take the opportunity to take a day off from cycling in which case, there are plenty of things to do and see in this historic and attractive town. The town is situated in an area where, in the 14th and 15th centuries, Jewish communities were protected, benefitting from the presence of the Popes in Avignon who granted them the freedom to worship and live peacefully, having been banished from the Kingdom of France. The Synagogue was built in 1367 and is one of the oldest in France. The Hotel Dieu in the town is an 18th century hospital with a well-preserved collection of apothecary jars, decorated walls and ceilings. Antique lovers will enjoy the Rue de Porte Mazan and the town's glass-covered shopping street. A short train ride away is the city of Avignon and the amazing Palace of the Popes. For those that would prefer to ride, options include the strenuous climb up Mont Ventoux, or riding east of Carpentras to find some of the Luberon's prettiest villages. Three of them have made it into the list of the 'Les plus beaux villages' (most beautiful villages) of France, an association of 144 villages selected on the quality of their architecture, environment and patrimony. This is one place where you can view lavendar fields if travelling in July as we continue south-east to arrive at Gordes where there may be time to experience the local street market. On the flanks of the Vaucluse plateau, just across the Luberon barrier, Gordes is a typical Provençal village. A maze of intricate lanes leads up to St Firmin's church and to the massive hulk of a Renaissance château perched on the top of the village (Optional longer rides available). The cycling route today gives us a taste of Provencal life, taking us through the lovely villages at the southern foot of Mont Ventoux, with a stop on the way for morning coffee, before reaching a local farm. Here we have a guided walk around the vineyards and olive groves with optional wine tasting and lunch (€25). Having eaten at the farm, there is time to relax and enjoy a dip in their swimming pool. In the late afternoon we cycle back through sleepy villages to our accommodation in Carpentras. The cycling route takes us southeast through the market gardens of the Vaucluse region following lanes across flat farmland and through the delightful old villages of Pernes-les-Fontaines and L'Isle-sur-la-Sorgue. Our route continues south of the Vauclause Plateau, giving the options to climb to the view points in a number of the villages dating from the 12th to 14th century. Our destination for today is Cavaillon, a key focal point in the Luberon, from its 1st century Roman Arch, 12th century Cathedral, Synagogue and Museums. The avenues are tree lined round the old town, offering occasional view up the hill of St Jacques, which dominates the area and offers some great walking. Our total cycling distance today is approximately 57 kilometres (total 163 metres ascent and 188 meters descent). If you prefer not to cycle today it is possible to take the public bus (30 minutes) to visit St Rémy-de-Provence, the birthplace of Nostradamus and one time home to Vincent Van Gogh. Today's cycle route crosses the river, passing through Orgon with its13th century Knights Templar castle. Heading south to Sénas, we ride through the fruit orchards, cross the river again and use some traffic free cycle routes which give superb views of the Lubéron escarpment. 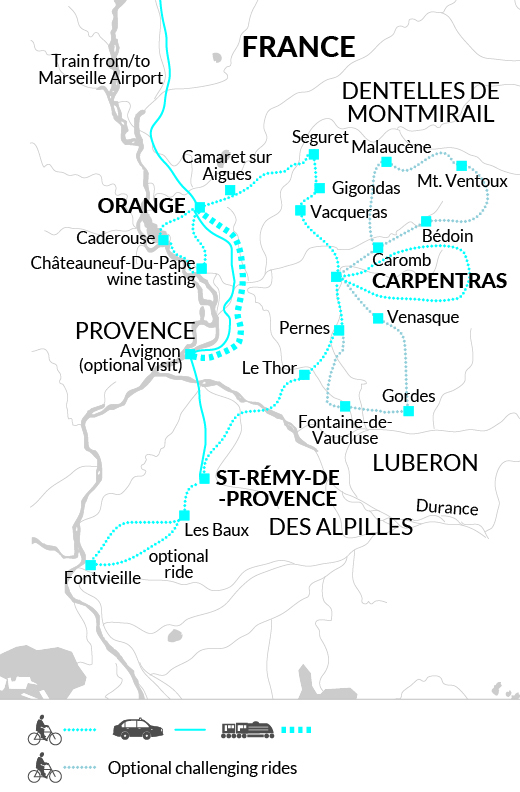 Following the edge of the forest, this route offers views along the Durance Valley before returning to Cavaillon, where there is some free time to explore the sites. After breakfast we drive from Cavaillon to Marseille Airport where the trip ends. Orange - Roman Theatre - and other similar sites around Euros 7 each. Avignon from Carpentras or St Arles from St Remy De Provence - around Euros 15 per person return (depending on train type). Pack essentially for hot weather. However, you must bring a warm sweater or jacket for cycling on cool days and for wearing during the evenings. In case of rain, waterproofs are essential. Also, a pair of long trousers or tracksuit bottoms are useful for cycling along hedgerow-lined footpaths. On all Explore cycle holidays we strongly recommend you bring along and wear your cycle helmet. In case of an accident resulting in personal injury, certain insurance policies are invalidated in cases where a helmet was not being worn. Cycle glasses to protect against dust, pollen and the sun, padded cycle gloves and a water bottle or water delivery system (e.g. camelback or platypus) are also useful. You may choose to bring your own gel seat cover for added comfort. If a handle bar bag or pannier is not provided (check bike details) then you may like to bring a small rucksack to wear while cycling. Other items to consider bringing are a sunhat and sun cream, torch, earplugs and insect repellent. Please carry some or all of your cycling equipment e.g. helmet as part of your hand luggage. A swim towel would also be useful for day 5. On this trip we cycle 259 km over six days (an average of 43 km per day) with further more challenging optional rides available. One of the more challenging options is the classic Tour de France climb of Mont Ventoux, for which you can hire road bikes locally. We use quiet, undulating roads although there will be several steeper sections. 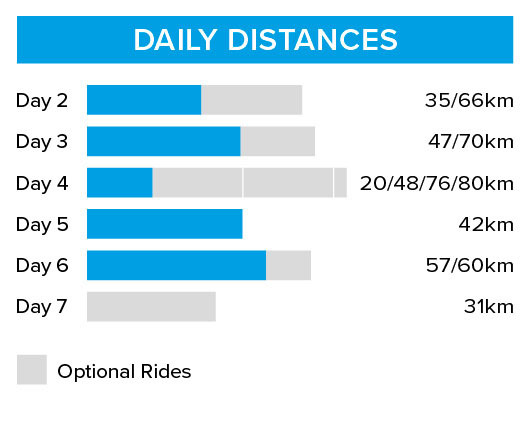 Maps are provided to cycle individually or in groups while the Explore Leader drives the support vehicle, except on circular routes when the Explore Leader will cycle with the group. We have graded the route as moderate. GPX files are available for this holiday. 21 gear RTE 520 hybrid bikes with front suspension. Electric bikes (e-bikes) are available for an additional cost for the duration of the holiday. Please contact us for more details or to request your e-bike.